A water truck that slammed into a parked American Airlines plane in January had a long history of malfunctioning, according to a safety report just released. 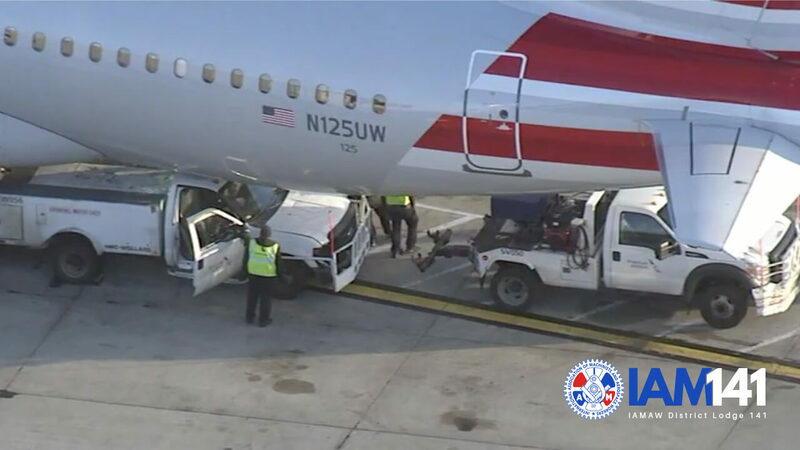 While servicing an American Airlines aircraft bound for Raleigh Durham, a water truck suddenly lurched into gear and lodged itself under an Airbus A320, causing the plane to be removed from service. No passengers were on board the aircraft, and no one was injured in the incident. This week, new data is suggesting that the vehicle had a troubled history. According to a comprehensive safety audit conducted by the Machinists Union in Philadelphia, the vehicle had been removed from service by fleet service workers at least nine times over the past year. The truck’s safety reports included complaints about the vehicle’s transmission and brakes. Despite these mechanical issues, managers demanded the truck be returned to service without first undergoing critical safety checks. American Airlines executives and managers are under fire for recent attempts to outsource the work of fleet service agents who perform safety audits at the airline, and for pressuring mechanics to rush inspections and repairs. In a shocking report conducted by CBS News, 26 Mechanics at American Airlines came forward to report unethical and potentially dangerous pressure from management to look the other way when they encounter safety issues – to get the planes and equipment back into service faster. The study by CBS News largely agrees with the findings of the Machinists Union, which systematically tracks and monitors safety issues at American Airlines in an annual report called the “Safety System Annual Report.” The study offers a comprehensive overview of thousands of safety reports filed throughout the year by airline employees. The annual report is conducted as part of UnionSafe141, a safety program that began at PHL airport and has expanded to more than a dozen major airports around the nation. The UnionSafe141 program is carried out by fleet service workers at American. More information about the program can be found at UnionSafe141.org. The report meticulously logged and tracked more than 15 thousand safety issues over the past year, including broken and worn-out airport equipment, injuries and other mishaps.